27" (68.5 cm) chest circumference and 13¾" (35 cm) long. Kettu i s the Finnish word for “fox,” and there is a very special Finnish myth that explains how an Arctic fox was apparently responsible for creating the ethereal aurora borealis, otherwise known as the northern lights. This busy fox started fires as it ran about on the snow, sweeping up the snow and ice crystals with his bushy tail and scattering them far and wide like embers and sparks into the night sky. 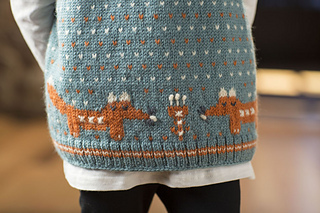 However, the foxes on the Kettu Top look more like they are quietly contemplating an ice flower that has suddenly appeared during a magical snowstorm! 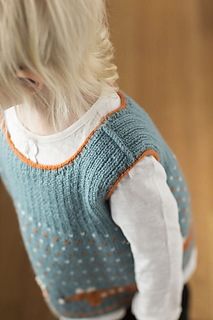 This little Kettu top is knitted in the round but split at the armholes. 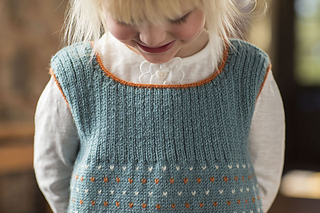 The ribbed top part is then knitted backward and forward on two needles. 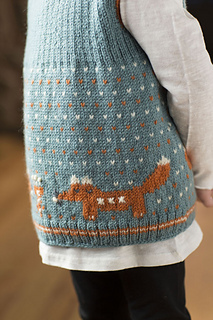 Duplicate stitch is used to fill in the lice stitch pattern, and simple embroidery stitches are made for the fox’s eyes, nose, whiskers, paws, and snowflake patterning. 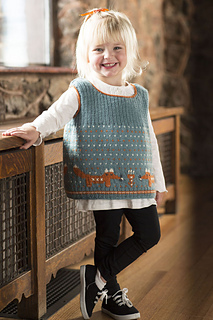 A single row of twined knitting around the neck and armholes creates a subtle decorative edge. Size 3 mm (no equivalent; between U.S. sizes 2 and 3) 24” (60 cm) circular (cir) and 2 doublepointed (dpn). Size U.S. 2 (2.75 mm) 16” (40.5 cm) circular (cir) and set of 5 double-pointed (dpn).